Turnabout, it seems, really is fair play. 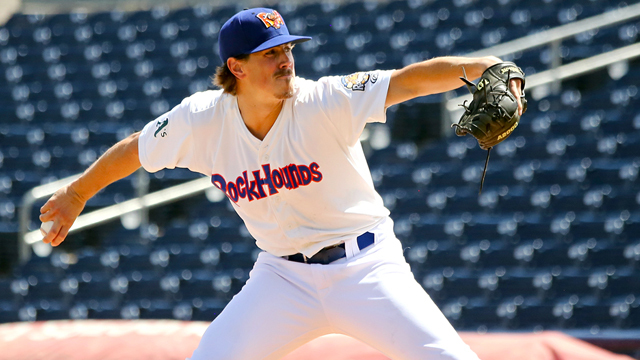 On their season-opening road trip, the RockHounds spoiled opening night in Frisco with a 3-0 shutout and the first-ever Sod Poodles game at HODGETOWN in Amarillo with a 9-4 win in 10 innings. Thursday night at Security Bank Ballpark, Frisco returned the favor. A three-run first inning would be the difference as the Riders won their sixth straight game, 5-2 (see below). Until Frisco added insurance with pair of solo home runs in the late innings, all the scoring came in the first, and not without a touch of controversy. The RoughRiders led, 1-0, with two on and two out and an 0-2 count on Michael DeLeon. Parker Dunshee narrowly missed with the 0-2 delivery and DeLeon singled on the next pitch, driving in two runs. In the home half of the first, Dairon Blanco sent Jonathan Hernandez' first pitch into the right field bullpen, his second home run in as many games (Dairon had a grand slam in Wednesday's 11-5 win at Amarillo). Greg Deichmann drew a walk and stole second, and Mike White sent a line drive toward left fielder Brendon Davis. The play was initially called a hit, but Riders manager Joe Mikulik argued the call, and, after a conference, the umpiring crew overturned the call. Luke Persico followed one out later with an RBI single, making the score 3-2. Both starters then settled in and Frisco reliever Walker Weickel added three scoreless innings, keeping the 3-2 score on the board until Chuck Moorman's massive solo home run in the seventh and Preston Beck's fourth of the season, a line drive to right in the eighth. Jairo Beras walked Edwin Diaz to open the ninth before getting the next three outs for the save. Frisco is now 6-1 and the 'Hounds are 3-4. The clubs also have a game "pending" ... last Sunday's contest at Frisco was suspended due to rain with the 'Hounds leading, 4-1 (and still batting), in the 11th. The clubs continue their four-game series Friday night at Rocky Town with first pitch at 7:00. Great stat compliments of Ryan Roulliard, Frisco's radio voice - - last season, the RoughRiders didn't post back-to-back wins until games 38 and 39 of the season. They have now (with the suspended game not yet in the books) won six straight and lead the division. Manager Scott Steinmann made what might be considered an unusual move, putting Luke Persico in the five spot in the order. The 'Hounds left fielder, who was 2-for-20 entering the game, matched his season hit total, going 2-for-4 with an RBI. The 'Hounds have committed just three errors in eight games. Two of them are on outfield throws, one of those in near 40-mile-per-hour win in Amarillo. The RockHounds also have four outfield assists ... one more than the team error total. Luis Barrera (right shoulder) missed his third straight game Luis is 9-for-21 (.429) through the season's first five games, with two triples, a home run and four runs batted in.